It's been pretty quiet on the consumer Wi-Fi front lately. The dearth of new products is mostly due to companies working feverishly behind the scenes to ready their draft 11ax products. ASUS and D-Link have already shown their hands, and I suspect Linksys, NETGEAR and perhaps others may be making announcements either at Computex Taipei in a few weeks, or shortly after. 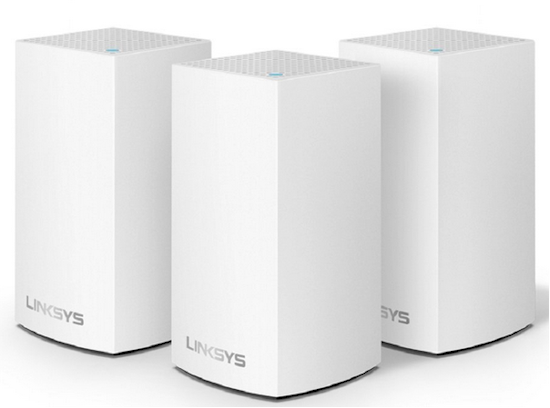 In the meantime, Linksys has started shipping the lower cost version of its Velop Wi-Fi system that it announced at CES in January. The Velop Intelligent Mesh WiFi System aka Velop Dual-Band, shaves around $130 off the price of a three-pack by dropping the second 5 GHz radio. The result is a another Qualcomm-based dual-radio three-pack Wi-Fi mesh system intended to lure potential Google Wifi buyers with its lower price. Velop DB has the same square-to-round tower form factor and approximately 3" x 3" footprint as Velop TB (Tri-band), but it's notably shorter (5.5" vs. 7.3"). It comes only in white, but in one, two and three-pack SKUs. I tested the three-pack. ...but the dual Gigabit Ethernet connectors have been moved to the back. This may reduce WAF a bit due to higher cable visibility, but it's a helluva lot easier to connect to. Velop can use Ethernet as backhaul, but this option still isn't part of the app's setup process. You'll just need to set everything up first using wireless backhaul, then connect the desired nodes to Ethernet. You can also bypass Velop DB's NAT router and run the system as APs by choosing Bridge mode in the Internet connection setup controls. Velop DB's FCC documents are under wraps for awhile. So after testing was done, I opened one of the nodes up for a look. Besides dropping the second 5 GHz radio, Linksys has also made a few other changes to come up with the DB. RAM has been cut in half to 256 MB and flash put on a crash diet, dropping from 4 GB to 256 MB. The DB also has a Qualcomm IPQ4018 vs. the IPQ4019 found in the TB and uses different external components. The board photo shows a single set of printed circuit dual-band antennas sitting in the black frame at photo left are driven by combined 2.4 and 5 GHz RF chains. The antennas sit at the top of the tower when everything is put back together. A separate 2.4 GHz antenna (not shown) for the Bluetooth 4.1 radio sits lower in the tower. A similar approach is taken in the TB design, which has filters on the 5 GHz chains to separate the low and high band radios. There's not much to see on the other side of the DB board, aside from the 256 MB of DDR3 RAM and CSR 8811 Bluetooth 4.1 radio SoC. This is in constrast to the TB, which has another 5 GHz radio on its backside. The table below summarizes the DB's components along with the TB and Google Wifi's for comparison. Note the Zigbee radio that was never enabled on the TB isn't included in the DB. Velop DB's feature set is summarized in the tables below. Basically, no features have changed since the original Velop hit store shelves. Linksys says the app has been tweaked to improve the setup process, look better on iPhone X and squash bugs. The Channel Finder feature also handles networks with five or more nodes better. Band steering is still not supported, but 11k and v roaming assistance still is. The other features are as described in the original Velop TB review. The updated User Guide has lots of app screenshots and describes most of the feature set. Note that Velop has a web admin GUI available at http://192.168.1.1. You'll have to jump through a few hoops to access it, but the GUI guides you through the process. Once you're there, you can fiddle with the hidden advanced-wireless.html page if you dare. The regular Wireless settings page will let you set a different SSID for each band, but you can't set operating channels. Futz with this stuff at your own risk. Remember, you're supposed to leave the Wi-Fi driving to the System in Wi-Fi systems.